Senator the Hon Scott Ryan, Senator for Victoria, has been sworn in as Minister for Vocational Education and Skills. Senator Ryan had been serving as Assistant Cabinet Secretary since September 2015 and previously served as Parliamentary Secretary to the Minister for Education and Training. Learn more about Senator Ryan on his website. Submissions to the Quality of assessment in vocational education and training – Discussion Paper close next week on Friday 11 March. For further information, including how to make a submission, please refer to the Department of Education and Training’s website. The Australian Industry and Skills Committee held its sixth meeting in Melbourne on 18 February 2016. The communique is now available. On 19 February 2016, the Australian Industry and Skills Committee (AISC) met with some 70 Chairs of the Industry Reference Committees (IRCs) and representatives of newly appointed Skills Service Organisations (SSO). Also represented were Industry Skills Councils who are providing SSO services to the mining and drilling, manufacturing and automotive sectors until SSOs are identified for these sectors. AISC Chair, Mr John Pollaers, highlighted the driving role of IRCs in the new arrangements for training package development which commenced in January 2016. He also noted the critical role of SSOs in supporting and enabling IRCs. Senator the Hon Scott Ryan, newly appointed Minister for Vocational Education and Skills, addressed the meeting and reiterated the importance the Australian Government places on a high quality and industry-responsive vocational education and training system. Kerry-anne Aspinall wanted a career change but was unsure how to make it happen. Thanks to the Skills Checkpoint Pilot, she now feels able to pursue new opportunities. Ms Aspinall is one of the first clients serviced under the Australian Government’s Skills Checkpoint Pilot. The Pilot offers free career advisory services for employed individuals aged 45 to 54 years. Skills Checkpoint providers use screening and testing tools to analyse and assess a client’s skill level, interests and experience, providing individualised advice to help them progress in their career, change roles or explore new opportunities. “I enjoyed completing the skills analysis component of the program,” Ms Aspinall said. “It has helped me to identify gaps in my skills and knowledge. At my age, the thought of training can be daunting, especially if you don’t know what course to complete or training provider to use." “The program has equipped me with the confidence to pursue training pathways I never knew existed." 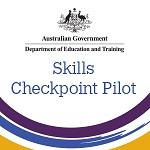 The Skills Checkpoint service is available through select locations in NSW, ACT, Victoria, Queensland and WA until the end of May 2016. Every participant receives a career plan. Mr Mark Callaghan, CEO of WorldSkills Australia, has announced his resignation fron the organisation. He commenced with WorldSkills Australia in 2005 and was appointed CEO in 2006. The Board of WorldSkills Australia expressed their gratitude to Mr Callaghan for the commitment, professionalism and passion he demonstrated in his role. The Board also noted that his stewardship was instrumental in positioning WorldSkills Australia as the successful organisation it is today and that the benefits of his leadership had positively influenced the lives of many young Australians. Ms Brigitte Collins has been announced as interim WorldSkills Australia Chief Executive Officer, pending the completion of the CEO recruitment. Ms Collins has trained, coached and judged at the regional, national and international level and is currently Australia’s International Technical Delegate for WorldSkills Australia. EARLY COLLECTION and VERIFICATION – Verify USIs as early as possible! RTOS will still need to verify a student’s USI even if they don’t plan on creating a USI on a student’s behalf. It is important that RTOs verify USIs at the time of collection wherever possible and before the student completes enrolment or as soon as possible afterwards. When a student has a USI but does not have it handy when they want to enrol, the student will need to provide the exact details they have in their USI account. Follow up with students as early as possible as it can be tricky locating the student after training is completed. System to system connectivity allows for a more streamlined process to create and verify USIs through your own system? Are you connected? If not, get connected with us today. USI Transcripts – Reporting Right. Reporting Early. It is important for RTOs to ensure their data submission is correct! Data submitted will be used to generate USI transcripts for their students. Any errors found in transcript information will need to be corrected not only in their student management system but also in the NCVER data collection, so submitting accurate data the first time will save time and effort. National Skills Week, running from 29 August until 4 September this year, continues to celebrate and inform students and the wider public of the diversity of career pathways available through Vocational Education and Training (VET). The 2016 National Skills Week, New World, New Vision, Your Future, aims to challenge people to consider how much they really know about VET, the progression opportunities, and the rapidly changing jobs market. The increasing use of technology is one of the integral factors changing the nature of work, and therefore skill requirements of Australian Industry. Read more about National Skills Week or send an email to find out how you can become involved. For most people, starting a new job means locating all the personal documents required by their new HR department. This process can be stressful for workers moving from job to job in industries like construction and mining where up to date documentation is crucial for compliance purposes. New Australian startup TradePapers has created an app that allows users to take and store images of licenses, tickets and other documents directly into the app. Stored as high resolution, these images can be clearly viewed when emailed to relevant parties. As well as providing storage facilities, TradePapers encourages workers to keep paperwork current by commencing automatic push notifications three months out from when a license or ticket needs renewing. The app costs $2.99 to download and allows users to upload up to 10 documents and 10 additional reminders. In-app purchases are available for greater storage and more reminders, while a premium version to be released in coming weeks lets users upload documents and images directly from their computers. TradePapers applications are for industrial-based work sites anywhere in the world and can also be used in other industries where contract workers need to provide proof of current qualifications and tickets such as nursing, child care and security. The NSW Government is offering Jobs of Tomorrow Scholarships to students undertaking selected government-subsidised qualifications on the NSW Skills List in areas related to science, technology, engineering or mathematics (STEM). Students who commence training in one of these qualifications, on or after 1 January 2016 with an approved Smart and Skilled training provider, are eligible to apply for a Jobs of Tomorrow Scholarship worth $1,000. More information about the scholarships is available on the Smart and Skilled website. 8 April 2016 - applications for scholarships close. The Australian Overseas Foundation (AOF) provides scholarships that enable Australians between the ages of 21 and 31 who have completed a trade apprenticeship or vocational traineeship to Certificate III level to travel and work overseas. Through its scholarships, the AOF aims to identify outstanding young vocationally-trained Australians, help develop their leadership skills, and increase their knowledge and experience that subsequently will be reinvested in Australia. Interviews will take place between 18 and 20 April with scholarships scheduled to be awarded on 25 May. Read more about the scholarships and the application process. Ever wanted to enhance your learning through study in the USA? Then the Fulbright Professional Scholarship in Vocational Education and Training may be what you are looking for! The scholarship offers the opportunity for employees within the vocational education and training sector or training leaders in business and industry to undertake training or research programs in the USA for 3–4 months supported by a living and travel stipend. Applications close 1 August 2016. 11 March, 2016 - applications close for the joint Industry Innovation Scholarship. This scholarship supports applied research between TAFE and industry. Applications including co-sponsorship contributions by industry are strongly encouraged. Read more or contact Melinda Waters on (02) 92174951 or at mwaters@tda.edu.au. managing the training packages through the endorsement process on behalf of IRCs. More information about SSOs is available on the Department of Education and Training website. Australian Institute of Certified Practising Trainers (AICPT) is a professional membership organisation for training practitioners, recognised for their academic achievements, practical skills and knowledge and a total understanding of the training environment. AICPT is a professional body committed to quality service, integrity, professionalism and professional development. AICPT services for members include professional trainer certification leading to Certified Practising Trainer (CPT), education, training, technical support and advocacy. Staff and members work together with local and international bodies to represent the views and concerns of the training practitioner profession to governments, regulators, industries, academia and the general public. For individual membership and corporate membership details, please visit the AICPT website or email membership@aicpt.org.au. SkillsDMC will provide the function previously delivered by the Industry Skills Councils to the resources and infrastructure industry in Australia. In the Australian market, SkillsDMC will continue to represent the skilling needs of the Coal Mining, Metalliferous Mining, Quarrying (Extractive), Drilling and Civil Infrastructure sectors. This includes continuing to develop the industry-validated competency framework for high quality skills development in these industries. Read more about SkillsDMC. CPSISC has developed a suite of resources to support delivery of the newly redeveloped unit of competency, CPCCWHS1001 Prepare to work safely in the construction industry. The resources will be available when the unit has been endorsed and released onto training.gov.au. This new and improved pocketbook for learners will be available in hard copy and will include key information about health and safety legislative requirements; risk management and construction hazards; health and safety communication and reporting; and incident and emergency response. Available in hard copy and electronic (for iPads), this customisable template provides a detailed delivery strategy and assessment tools and resources to support trainers and assessors in quality delivery and assessment of the unit. This online resource for trainers, assessors and learners will be accessible via mobile and hand-held devices to support delivery of the unit. It will provide a summary of the construction hazards covered by the unit as well as some suggested risk control strategies. In preparation for the release of these resources, CPSISC is collecting pre-orders. Don’t miss out. These resources will be in demand. For more information, and to download the pre-order form, visit the CPSISC website. International Women's Day, held each year on 8 March, is a global celebration of the social, economic, cultural and political achievements of women. Read the stories of Renya Xydis, Jessica Benge and Jane Alia and celebrate what women are achieving in Australia. Renya Xydis, the owner and creative director of multiple hair styling salons across Sydney, is one of Australia's most successful business women. An industry leader in the hair and beauty profession, she attracts high profile clientele and works on editorial fashion shoots and runway shows both locally and internationally. Renya credits much of her achievements to the foundations which her Australian Apprenticeship provided. Now, as an Australian Government Ambassador for Australian Apprenticeships, and as an employer of many Australian Apprentices herself, Renya encourages people of all ages and backgrounds to consider an apprenticeship or traineeship. Read more about Renya and watch a video of her in action. Each day, Jessica Benge gains inspiration through helping children with disability. She believes it’s important to find a career that you are passionate about and for her, being on the job doing something she loved and gaining lifelong skills was the best way to learn. Jessica acquired a Certificate III in Disability then completed a Certificate IV and began a Diploma in the same field. She has been Tasmanian Trainee of the Year and was a finalist at the 2013 Australian Training Awards. In 2014, Jessica received an Australian Overseas Foundation scholarship and worked in Canada as a disability assistant for Austin, a promising go-kart driver with autism. She visited schools across North America with the Racing with Autism crew, giving Autism Awareness presentations based on Austin's story, and is now completing an Autism Awareness tour of Australia with Austin. Read more of Jessica's story. Jane Alia was a teenager when she arrived in Australia as a refugee. Having a keen desire to understand more about health care services, she undertook an Australian School-based Apprenticeship and is now a fully-qualified dental assistant. Jane has been the Northern Territory School-based Apprentice of the Year, a finalist at the Australian Training Awards and has received the Minister for Young Territorians Excellence in Youth Leadership Award and a Layne Beachley Aim For The Stars Foundation grant. Jane believes education is the key to success and advises other young people, including those from a migrant or refugee background, to take up opportunities for apprenticeships or traineeships. Read more of Jane’s story and watch her in action. This year’s conference, Skilling for Growth, is focused on ensuring that Australia’s workforce is sufficiently skilled and agile to meet the economic challenges of constant technological change. Book now to join with the group training network and be part of a critical conversation around the policy and practice required to ensure effective Skilling for Growth. Women: Education, Empowerment, Equality will be the theme for this year’s WAVE conference. Don’t miss the opportunity to hear from a broad selection of presenters on the importance of empowering women and girls through education. WAVE, a national network at the forefront of women’s advocacy, is involved in VET to promote women and girls through training, education and employment opportunities. The 2016 event is set to be bigger and better than ever - save the date, spread the word and be sure to go along to witness to the transformational power of education. Read more. The 2016 conference theme is Putting VET research to work: collaboration, innovation, prosperity and with a great line up of keynote speakers it is sure to be an unmissable event in the tertiary education calendar! As the principal research body for the VET sector, AVETRA understands the significant value VET brings to Australia’s ‘Industry Innovation and Competitiveness agenda’ through research into the issues affecting the sector and the innovative capacity of the workforce. AVETRA’s 19th Annual conference places these issues at the centre of debate and calls for new ideas about how research and innovation in VET and enterprises can be better supported to support Australia’s economic future. Mr Peter Noonan – Investment in VET – the past, the present and the future. For more information or to register, visit the AVETRA website or contact the 2016 Conference Secretariat by email or on (02) 9431 8600. 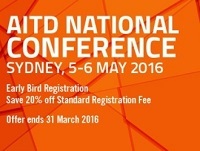 Book before 31 March for the 2016 AITD national conference and save up to 20% off standard registration prices. AITD's Annual National Conference is a highly regarded event for providing delegates with high quality, dynamic presentations on an exciting range of innovative topics. We will be exploring technology, learning strategy, innovation, social and collaborative learning, leadership, talent development and more. Details about speakers and topics are available on the AITD website. Follow @aitd1 on Twitter #AITD2016 for updates. The Department of Education and Training is hosting an interactive and informative day filled with a selection of workshop sessions and panel discussions which will provide participants an in-depth overview of Australian Apprenticeships and the Australian Apprenticeship Support Network, the Preparing Secondary Students for Work framework and its concepts as well as a demonstration of tools, resources and information products available to VET practitioners and students through the Department. The day will conclude with a tour of Crown College and incredible facilities including the purpose built Culinarium, encompassing an award-winning training kitchen and restaurant giving participants an opportunity to see first-hand how quality programs are delivered to meet industry needs. The 26th Annual National Conference of the Career Development Association of Australia (CDAA) will feature a diverse range of presenters and thought-leaders on Australia’s continuing need for Evolution and Innovation to tackle the inevitable Transformation. Keynote speakers for the conference are Mr Mark McCrindle, Ms Maxine McKew and Dr Joanne Earl. The Conference will explore the way that Science, Technology, Engineering and Mathematics (STEM) are promoted as key pathway opportunities, with many commentators identifying future shortfalls in talent possessing these skills, while careers of the future that demand STEM increase significantly. Visit the conference website for more information, to download the program or to register. The VETnetwork Australia Biennial National Conference is a highly regarded (and attended) professional learning event for Vocational Education and Training (VET) practitioners across Australia and VETnetwork Australia has successfully hosted the National Conference for some 20 years. VETnetwork Australia will also be hosting a Masterclass on Friday 29th July which available to all delegates at time of registration. For more information and registration please visit the VETnetwork website. Evolution: developing a skilled and flexible workforce to adapt to rapid technological change in the workplace, and to improve national competitiveness. Registration will open in March 2016 in conjunction with the conference program release. More information is available on the NCVER website. Visit the National Skills Week website for more details. Celebrating VET, the 2016 National VET Conference, will focus on multiple streams including Policy and Reform; RTO Management and Compliance; Training and Assessing; VET Shapers; and eLearning. For more information about the Conference, visit the Velg website or contact the Events Team on (07) 3866 0888 or at conference@velgtraining.com. Get your ticket to the 2016 WorldSkills Australia National Competition to see Australia’s finest young apprentices, trainees and students in the nation’s largest trades and skills challenge. Registrations to attend the 2016 Australian Training Awards presentation dinner event will open 1 July 2016. To register your interest in attending please email australiantrainingawards@education.gov.au and we will forward registration details to you on the opening date. Indigenous Conference Services is proud to host the International Indigenous Health and the International Indigenous Allied Health Conferences simultaneously this year, allowing delegates to interact and participate in both conferences whilst only having the expense of one event. Similarly, exhibitors at either of the two conferences will be able to reach twice the audience for twice the impact, with only the cost of one booth. The conferences have attracted high quality international First Nations’ speakers from North and South America, New Zealand, Canada and Scandinavia as well as abstract submissions from every Australian state and territory. To register, please visit the conference website or send an email. Get a taste of your favourite skills and trades in 15 seconds! SkillsOne has launched the SKILLS BITES channel, a series of social media videos depicting skills and trades in 15–30 second videos, created to get people excited about vocational careers. Watch the videos or email SkillsOne to request information about having your own SKILLS BITE video created. Supplies of a small card highlighting the Australian Apprenticeships Pathways website and the new AusAppPathways mobile app are now available to order for free from the Australian Apprenticeships and Traineeships Information Service. These cards are ideal handouts for organisations that have face-to-face contact with students and jobseekers, such as Australian Apprenticeship Support Network providers, Registered Training Organisations, jobactive providers, Disability Employment Services providers and career advisers at schools. An AusAppPathways printed flyer and a small poster are also available. If you are interested in placing an order, call 1800 338 022 or email contact@aatinfo.com.au. • Easy video streaming through your LMS: Why reinvent the wheel? • Visually track your learners’ progress. The VET PD Network is here! The VET PD Network seeks to support the capability and capacity of the VET sector by providing a range of professional development opportunities for RTOs, including practical, solution based face to face workshops. Strategies for Training and Assessment. Visit the VET PD Network website for additional titles and more information or go to their Contact page to register for a workshop in your location or discuss other professional development services. In 2016, two Virtual VET Summits will be presented live online, with attendees able to participate from anywhere in Australia (or the world) and have access to a range of up-to-date information from leading industry experts. Each VET Summit will include 10 sessions of practical, useful information steamed over two days. Attendees will be able to view the content as it is being delivered and also be able to interact in a real-time discussion forum with the facilitator and their peers without leaving their desk. 15 and 16 March 2016 - Trainer and Assessor Summit. Register today as places are limited! Adelaide - 29 April 2016. • VET Teacher Mentoring Program. Read more about these and other programs. • Free resources for the VET and disability sectors developed by Oggi Consulting and funded by the Australian Government. • VOCEDplus – the latest research on VET, skills and workforce development issues. If you would like to provide feedback, supply an article for inclusion in the next edition or join our list of subscribers, please email skillsatwork@education.gov.au. The next edition will be published in March 2016. Submissions are due by Friday 18 March 2016.